Premiered Project Arts Centre, Dublin 2004, reworked 2007 for Chinese tour. Produced by Fearghus Ó Conchúir in association with Project Arts Centre and with the support of the Arts Council of Ireland. Cosán Dearg, literally ‘red path’, is an expression that describes ground worn by frequent traffic. It is a metaphor for compulsion, repetition, and attachment. Cosán Dearg began as an idea that came to me when my eyes were shut at the end of a yoga session. I saw a creature in a sac that didn’t want to be born because it had already lived too much. When I participated in the Thread interdisciplinary workshop organised by the Fringe Festival in 2004, I began working on the image and on a physicality that would animate it. I met director Jason Byrne and composer Julie Feeney at the workshop and we began to work on the idea, presenting a work in progress showing during Thread and developing it for presentation at Project Arts Centre in 2004. That development involved the dancer Bernadette Iglich. Cosán Dearg has since been performed as a short solo in the 2007 Dadao Live Art Festival across China and as part of a programme of work called A Man’s Touch, presented in the Basque country in 2008. 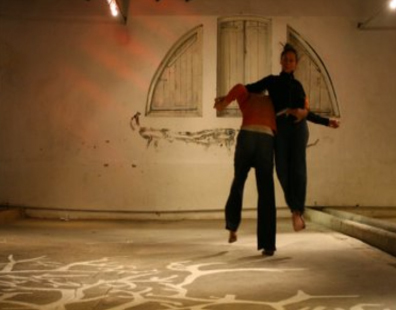 A version of the duet with Bernadette has also been shown in the 2007 Dadao Live Art Festival.